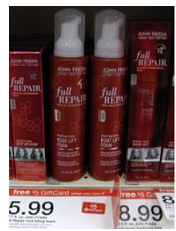 This $5 John Frieda Full Repair coupon is a Hot one today. Now you can score a great deal at Target too. The John Frieda Full Repair products are part of the Free $5 Gift Card wyb 3 John Frieda products. And, there is a $3/2 John Frieda Full Repair Target Coupon to stack with it.